The first step is the toughest. Fall is traditionally a time of noticeable change; a season to initiate new direction and get moving. Fall has certainly arrived in Lake Placid and personality or season; it is no surprise I am chomping at the bit to get into the new homestead as soon as possible. It is time to make a change, get ready for ski season and give a puppy a new home. Fortunately, progress at the new house is in sync with the seasonal energy and moving along very well. The first two layers of the roof are on and walls are going up. I was even pounding nails today. The building now feels like a house instead of a tree house, although the tree house effect was pretty nice. I was surprised when people first started asking me why Ed, a biologist, and I, a not-very-handy business person, are building our own house. I thought, “why not?” It is obvious to me and seems like the right thing to do. Since I’ve been asked the question frequently and have met with puzzled looks more than a few times when I mention our latest project, I decided to come up with some ready answers. When Ed and I gave the topic more focused thought and articulated reasons we have been working nonstop for 6 months, we found most of why we are building comes down to simple logic driven by personal preferences and style. For the record, we are fortunate to have the skills of top-notch electrical and plumbing consultants working with us. The site work, road building, foundation and concrete work were also completed by the respective specialty firms. Ed and I are completing the other home building tasks, from cutting down trees to placing posts and beams, to building finished cabinets and plastering the walls, and everything in between, with the able assistance of family and friends. When you build a house yourself you have more control on the entire process: you have a better chance to get what you want. For example, I don’t like sheet rock. It must be a critical personality flaw based on the response I receive from architects and builders when I tell them our house will contain no sheet rock. Some people have tried to talk me out of ‘such ideas.’ Since Ed agrees with me and we are doing the work ourselves, I don’t have to argue with anyone about sheet rock yes/no. Because a very large majority of our building materials (trees) came from the Adirondacks, the house is ‘greener’ than most. There will be very few manufactured products in the house and we are using recycled, refinished interior products such as an antique claw-foot bathtub and old chalk-board slate turned into counter tops. In addition to being cost effective, we lower our carbon footprint by using local supplies and reusing materials where possible. In addition to satisfying a controlling disposition and creating an environmentally friendly place to hang our tuque, building our house is also challenging, interesting, exciting and educational. One of the more creative projects I have ever been involved with, building our post and beam home from ‘scratch’ is also richly rewarding. Although this is our first self-built home, self-sufficiency is not new to us. Ed and I were Ruralpolitans before Mr. Murdach’s paper noted the trend last year. We’ve raised chickens and grown our own food off and on many times over the last 30 years. We might say this dream house project was the logical next step. 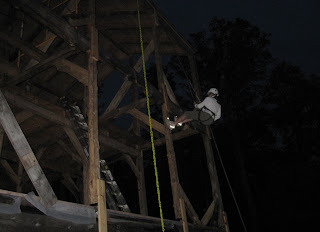 Today’s featured photographs are a glimpse of last night’s first descent and a heck of an exciting evening at the homestead. Although I always wanted to give it a try, I never felt comfortably safe enough to rappel. Last night, my very smart and safe friends, Jess and Dave from Towns and Trails, helped me realize a long held goal of mine - to try rappelling. It was a blast. 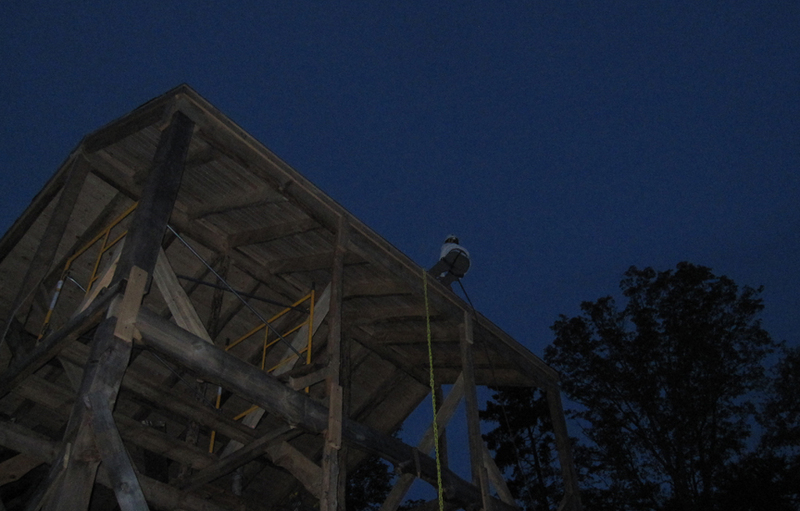 Not only did I rappel almost as well as Batman, but I rappelled down the face of the new homestead! Thanks Dave and Jess! I love it! Glad we could help. And now you have an extra fun way to wash all of those windows you're putting in. What is it About the Adirondacks?